The idea behind the subversion file header is that it always gets updated automatically by the subversion software whenever a user with subversion write access commits a file. 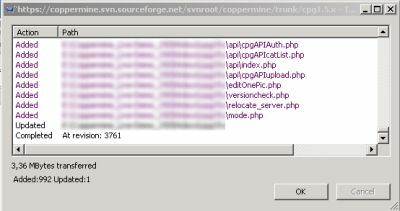 Think of the lines as placeholders: the subversion keywords $HeadURL$, $Revision$, $Date$ get replaced by their actual values - in this document, the equivalents are $HeadURL: https://svn.code.sf.net/p/coppermine/code/trunk/cpg1.5.x/docs/nl/dev_subversion.htm $, $Revision: 8884 $, $Date: 2018-12-21 21:21:36 +0100 (Fr, 21 Dez 2018) $. There is no point in manually editing the content of those values - remove the information if you're an end user and it bothers you, but it won't affect your gallery in any way, so it's easier to leave the subversion file headers as they are.